Before we can get into the details we have to know what we are working towards. IoT: Internet of Things, where all the connected things (devices) communicate effortlessly without latency (slow connection time) and predict your next steps to help you effortlessly live your life. That's vague - so let's imagine direct examples. When you open your door at home it has a smart lock. That smart lock signals to the lights in specific hallways or areas of your normal path to light up. Then you may have a routine of getting a glass of grape juice when you arrive home before you sit on your couch. The smart lights then communicate to the smart fridge that you're arriving. Then when that fridge is aware you are going to open it, after it is opened on the second time (unless you leave the door open when pouring your drink) it signals the smart TV to turn on. First off, IoT will most likely be adopted first by enterprises before we can get to the point individuals will be using fully integrated IoT in their homes. This is because enterprises have the funds to experiment with cutting edge technology to help them save potentially millions a year. Luckily, for the reader that means you benefit from their highly volatile and expensive discovery period. Since what they did on a macro- scale can easily be replicated on a micro-scale once it is perfected. The industries that can benefit first. 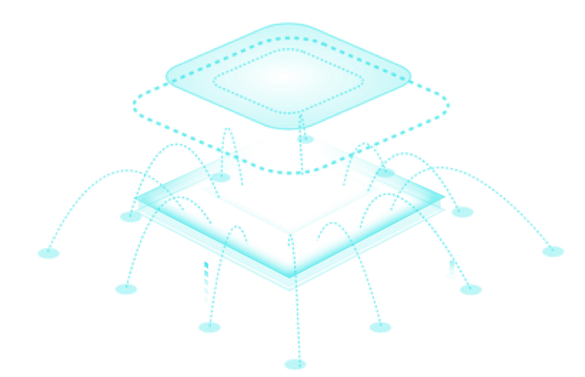 ION Chain uses edge computing as the solution for IoT devices because the physical distance between the user's device and the cloud to which it connects can create a latency issue. So what edge computing does is have some application processing performed by a small edge server positioned between the cloud and the user. The closer the edge server to the user, the better. The reason these devices are having issues talking to each other is because each individual device is connected to cloud terminals of their manufacturers; but there is no connection between the cloud terminals of different manufacturers. Lack of : cross-industry communication, cross manufacturer communication and cross-product category communication. That's why ION Chain is working towards the "One Device, One Coin, One Code" mantra. "Edge computing is the practice of processing data near the edge of your network, where the data is being generated, instead of in a centralized data-processing warehouse.” This means that the device itself processes the data, instead of sending it to a data center to be processed." "The IONChain Foundation is a not-for-profit oriented entity whose primary duty is to govern the ecosystem of IONChain. Right now in the IoT blockchain space IoT devices can not user PoW (proof of work) and it's not best to use PoS (proof of stake) or DPoS (delegated proof of stake). ION Chain has come up with their own patented algorithms which are Data Quality Verification Consensus Algorithm (DQVCA) and Proof of Time Consensus Algorithm (PTCA). "16-year experience of consulting and system architecture. Technology team management experience with over 300 employees. Former CTO of ZhiWang Fintech, Founder of Vonechain Blockchain and IoT systems. Former senior director of Accenture. Integrated Technology expert, designed integration solutions for Huawei, China Mobile, SAIC and so on. Senior blockchain lecturer for MA courses at Fudan University. MBA of East China Normal University." "20 years experience of television media & PR; received both provincial and national awards. Former COO & Chief Editor of ChainB （the leading blockchain media in China）. Co-founder & Former VP of Marketing and Content Production in Uni-Live. Graduated from Fudan University." "Blockchain Technology & Security Encryption Expert. Hyperledger China core developer, participated in Hyperledger Fabric Explorer project development. In blockchain programming since 2014." "More than 10 years experience on IoT device design. Industries including agriculture, medical, intelligent scenic spot and intelligent gateway. complete top-level design of IoT systems and application scenarios." "Co-founder of IONChain, Co-founder of Shidian Capital. Over 10-years experience on marketing development and business management in telecommunication industry, worked for Huawei US, HTC China and China Unicom (Shanghai), etc. Practical experience on managing enterprises with various attributes and intercultural teams. Master of Information Technology from University of Birmingham, National Senior Entrepreneurship Consultant." That was a lot of information to take in, now let's tie it all together now. 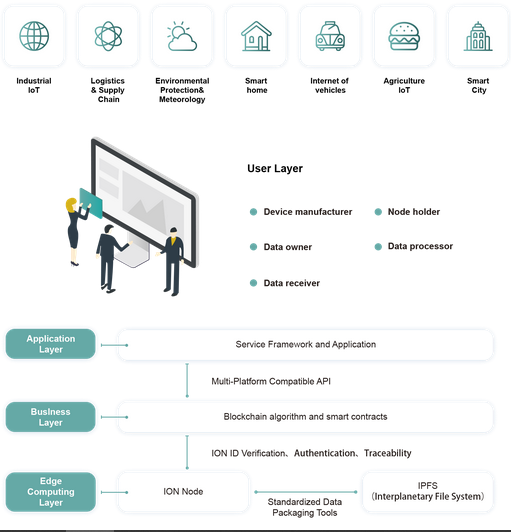 "How will IONChain impact the IoT industry? " ION Chain will create a platform using edge computing with their patented algorithms to enable the future that is IoT. Also, as this is blockchain and cryptocurrency they will have a token that each device on the IoT network can mine and accurately keep track of many functions, all secure (the cryptography of the blockchain) and standardized (all devices coming to consensus). "What is the implication of combining Edge Computing with blockchain technology? How will having a true IoT economy allow it to grow and hasten the process of mass adoption? The implication of combining edge computing with blockchain is that this solves the issues of lack of security from false IoT which is centralized servers. Also, regarding slow transaction speed IPFS (Interplanetary File System) has been integrated. Identity protections and verifications, also an incentivized market place based on their two new algorithms Data Quality Verification Consensus Algorithm (DQVCA) and Proof of Time Consensus Algorithm (PTCA). Congratulations @crypto-maven! You received a personal award!